Muhammad Akram has received MSc degrees in Mathematics and Computer Science, MPhil in (Computational) Mathematics and PhD in (Fuzzy) Mathematics. 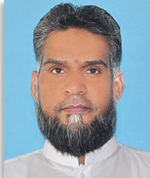 He is currently a Professor in the Department of Mathematics at the University of the Punjab, Lahore. He has also served the Punjab University College of Information Technology as Assistant Professor and Associate Professor. Dr. Akram’s research interests include numerical algorithms, fuzzy graphs, fuzzy algebras, and fuzzy decision support systems. He has published 6 monographs and 272 research articles in international scientific journals. Some of his papers have been published in high impact journals including Knowledge-Based Systems, Information Sciences, Expert systems with applications, Applied Soft Computing, Computers & Mathematics with Applications, Journal of Intelligent and Fuzzy Systems, Abstract and Applied Analysis, Soft Computing and Neural Computing and Applications. Dr Akram’s total impact factor is more than 165. His current H-index on Google scholar is 26 and i10-index is 90. He has been an Editorial Member of Mathematical Logical area of The Scientific World Journal (Hindawi, USA) and many other international academic journals. Reviewer/Referee for 120 International Journals including Mathematical Reviews (USA) and Zentralblatt MATH (Germany). Seven students have successfully completed their Ph.D. research work under his supervision. Currently, he is supervising more 5 PhD students.